There's an episode of The Good Life where Barbara hankers after a treat from their former executive days in the shape of their 'Pagan Rites': an excellent dinner followed by an overnight stay in a comfortable hotel. I believe The Pig tucked away in the New Forest is just the kind of place Tom and Barbara Good would choose. It's a former hunting lodge of the Bowes-Lyon family and it oozes graceful charm and good living. Here, all the cares of the world are easily tossed to one side and forgotten for the day. On arrival, the wall of the car park is a clue that things might be done just that little bit differently. Inside the hotel it's all squashy, comfortable sofas and a laid back vibe. A welcoming glass of champagne was the perfect start and I relaxed instantly. To accompany our champagne, we had a platter of 'Piggy bits' as our appetiser (top right in the collage). Absolutely delicious! Chef James Golding has devised a '25 mile menu', sourcing as many of the ingredients as possible from within that radius. A substantial part has zero miles at this time of the year as there's a large kitchen garden, plus pigs, quails and chickens to select from. 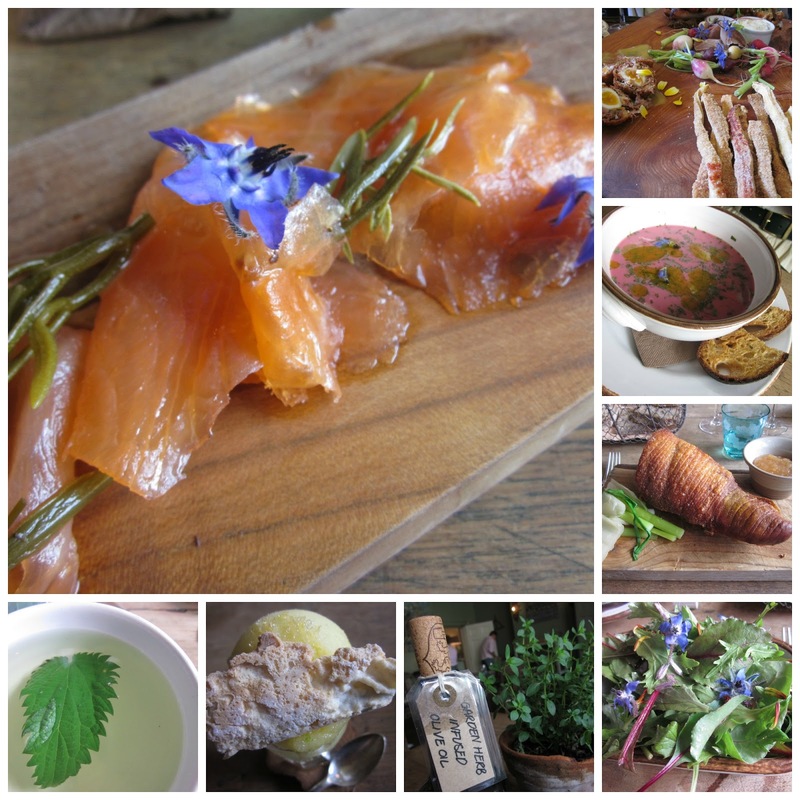 Seasonal foraged foods from the forest and the nearby seashore also feature. As befits the hotel's name, the menu we tried was biased towards pork products, but a separate vegetarian menu is also available. After lunch we were treated to a garden tour with James taking time out from the heat of the kitchen to show us around. We saw (and smelt - yum) the smokehouse and then were led into a walled kitchen garden plus greenhouse to die for. 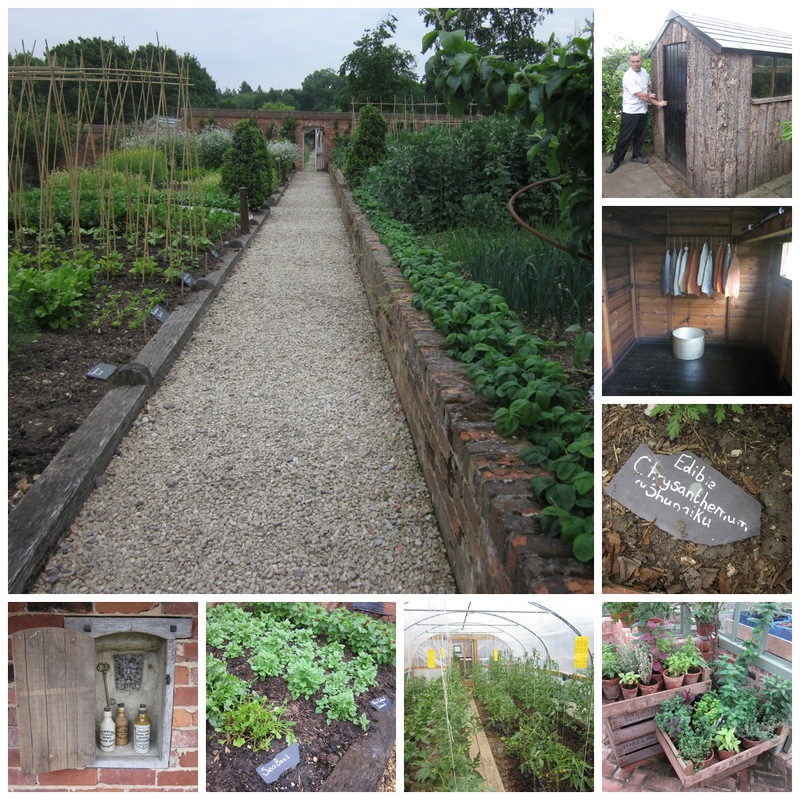 Here we were met by Ollie, the Head Gardener and it was fantastic to hear him and James enthusiastically bouncing ideas off each other on how the garden's produce and flavours could be combined in the kitchen. After a while we joined in with ideas of our own, inspired by everything around us. The best varieties for growing and flavour are chosen, but Ollie isn't afraid of trying new things for James to experiment with. Earth chestnuts (aka pig nuts) was one such crop we spotted and we were all given some edible chrysanthemum to try. Flowers loom large in the garden too, both to encourage pollinators (much in evidence, hurrah) and as an ingredient in their own right. It was reassuring to find the pig I'd sampled earlier had had as happy a life as this Tamworth was enjoying. It was great to share this absolute treat with blogging pals Helen and Matron - not forgetting Lottie, Naomi and Nick who'd gone by the time we got round to having a group photo. Wow, it looks absolutely wonderful. I love the kitchen garden, it's a thing of beauty! A perfect place to relax and unwind..
Hi VP! Sounds like you had the most fabulous day! I could kick myself (and, indeed, should!) as I was supposed to be joining you but had to decline due to an overwhelming amount of work with a deadline. I really wanted to see the walled garden but that will have to wait for another day. I'm often in the area but usually go east, not west, on the M27. I may have to go west next time and pop in for afternoon tea! It's not far from Beaulieu Motor Museum where there's another fabulous walled garden! Will you update us as to the fresh garden salad as part of the Salad Challenge?